This may be a total shocker to some of you, but in third grade I was not the cool girl. Definitely not the cool girl. But I also wasn’t the weird girl, the girl that smelled nor the girl that was super jockey and athletic. I was like, the antithesis of the situation you just read. My dad thought it was a genius idea to buy me boys’ tennis shoes because he thought they were “designed” better. So yeah…I have him to thank for that. I was shy and quiet and observant. And my hair was frizzy and always sort of a mess. My mom, nor I, could French braid despite how many times we tried. And my lunch…ugh…my lunch was always kind of lame. 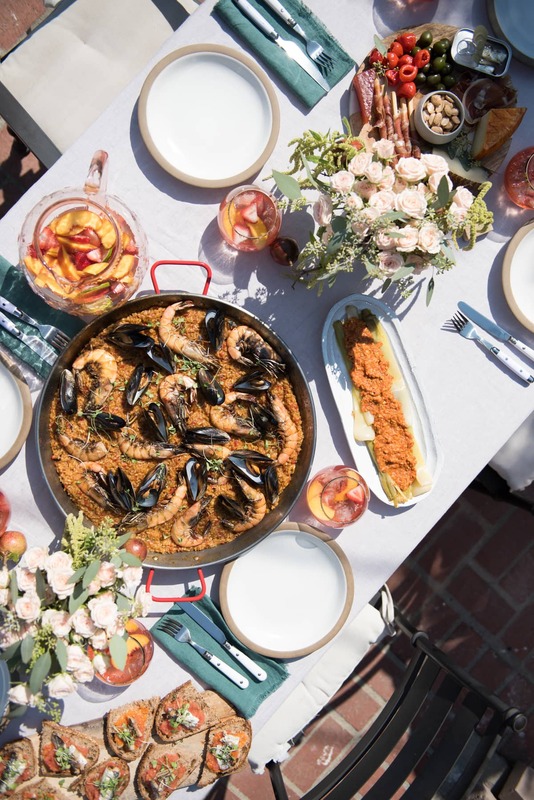 Think like, hummus, crudites and…arroz con pollo. Tell me! …how is a child supposed to be cool with yellow rice in their lunchbox?!?! But now…I’m a totally different person. I know how to use a blow-dryer. My clothes are better. That lunch would actually make me excited. And I know how to do regular braids, French braids and fishtails. Yeah…I totally graduated to braiding pro status. 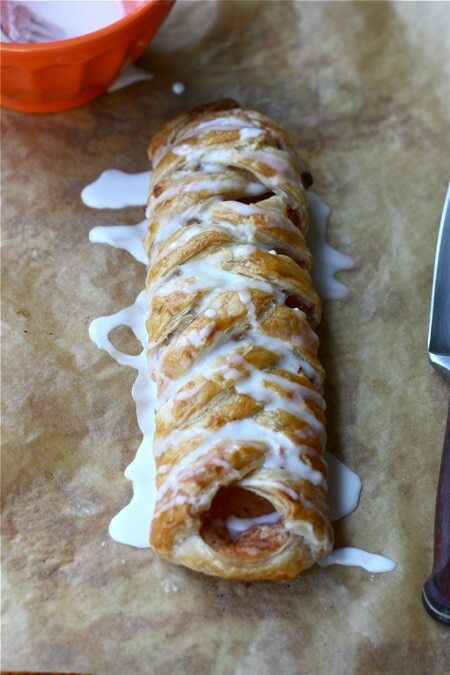 Despite who you were in third grade, everyone can braid this cheese danish. Everyone. Let’s talk frozen puff pastry. Sure…you can make your own, if you’re up for that. But if you’re not, try and buy the good stuff. 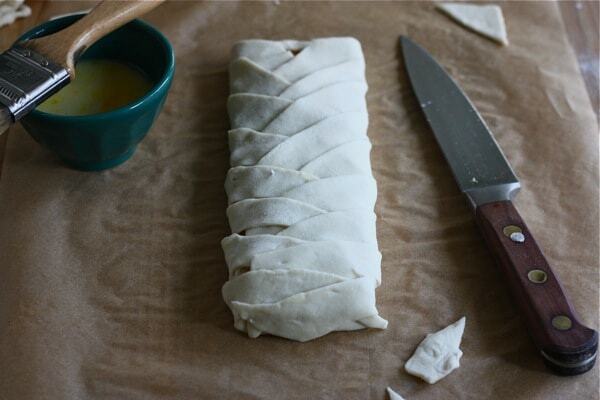 You’ll be able to spot it because puff pastry should only have a few ingredients: flour, water, salt and BUTTER. A lot of the ones at the store have oils instead of butter. A little pricey…but the quality was amazing. So so worth it. 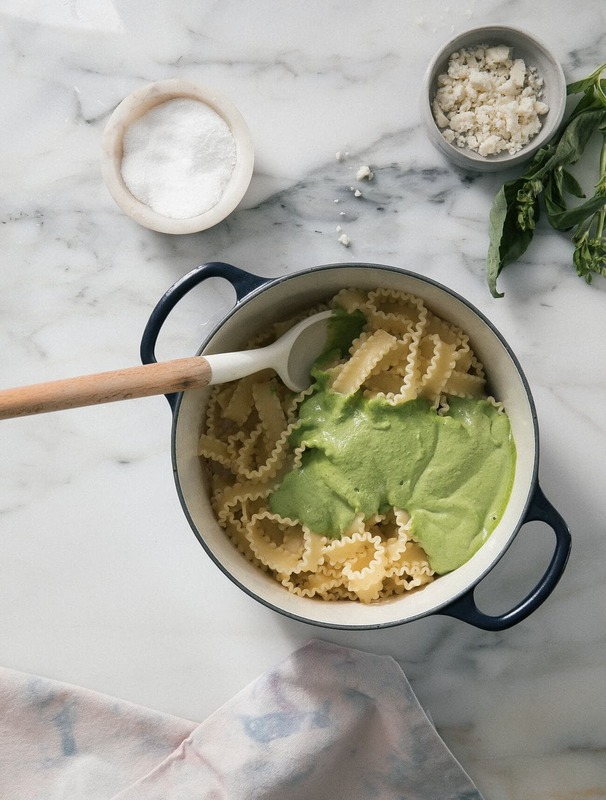 You’re going to start by throwing all of the filing ingredients in a bowl and mixing them up. It’ll smell tart. And delicious. 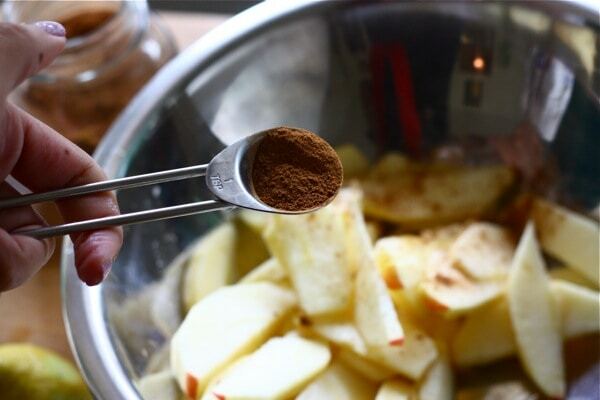 Next up you want to slice the apples and toss them with a little lemon juice, sugar and cinnamon. 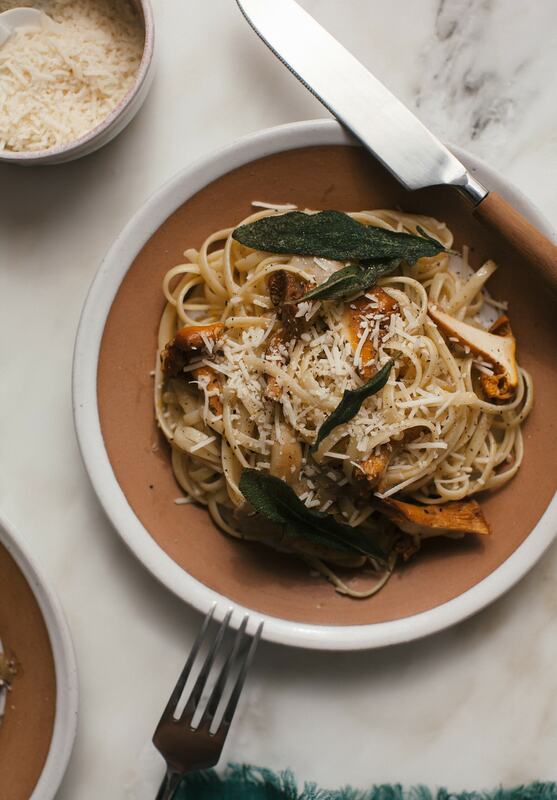 Fall in a bowl. Fall in a bowl. 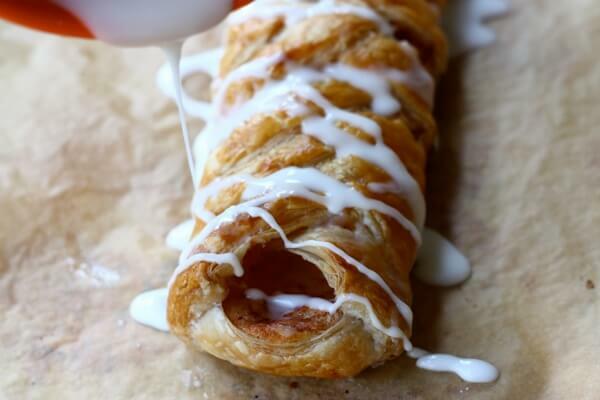 Take your defrosted puff pastry and roll it out. Mine was an annoying circle, so I had to cut it into a rectangle. No biggie! Cut off the top corners. And make triangular notches in the bottom part of the rectangle. Then make slits down both sides. Those are gonna be the pretty braids. Fill the center with a few tablespoons of the cream cheese mixture and smooth it out. And then braid! Sorta. This is when it gets really easy. Simply fold over the strips, alternating between sides. P.S. If you need more visuals, this video really helps! Trim away any leftover strips or dough. And when you’re done…it’ll look like this! Brush it with a little egg wash action, stick in the oven and bake. While it’s doing its thing in the oven, mix up the icing. Just powdered sugar and a tiny bit of milk. I had to play with the consistency a bit. I wanted it to be thick. 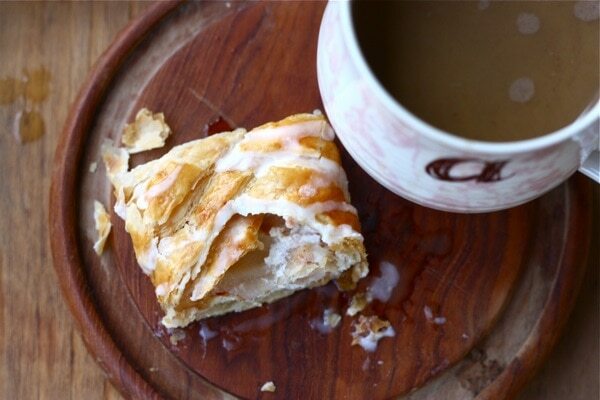 And then…pour it all over the warm apple cheese danish.. The filing in this cheese danish is just the perfect amount of tartness; it isn’t overly sweet, which makes the icing welcome…perhaps even necessary?! And the cinnamon and sugar speckled apples practically become one with the cheese…after the 20 minute baking time. This is all such a good thing. But for real, this thing really would be perfect for it. 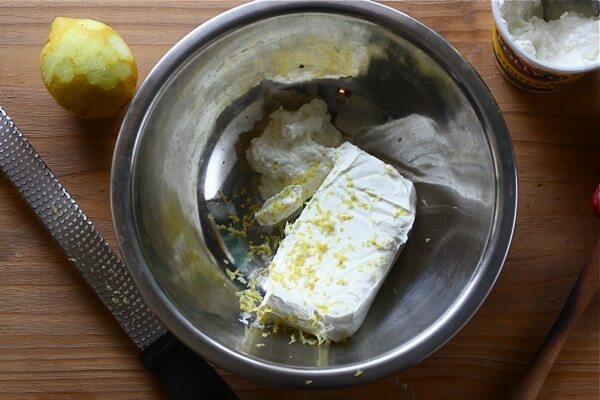 In a medium bowl, place the cream cheese, ricotta, lemon zest, vanilla, salt, 4 tablespoons of sugar and mix until smooth, using an electric mixer fitted with a paddle attachment. Set aside. Peel and slice your apples into 1/4-inch slices. In a small bowl toss them with 1 tablespoon of sugar, cinnamon and juice from the one lemon. Carefully unfold 1 sheet of puff pastry and roll slightly with a floured rolling pin until it’s about 1/4-inch in thickness. Since mine was a circle, I cut it into an 11″ x 8″ rectangle. 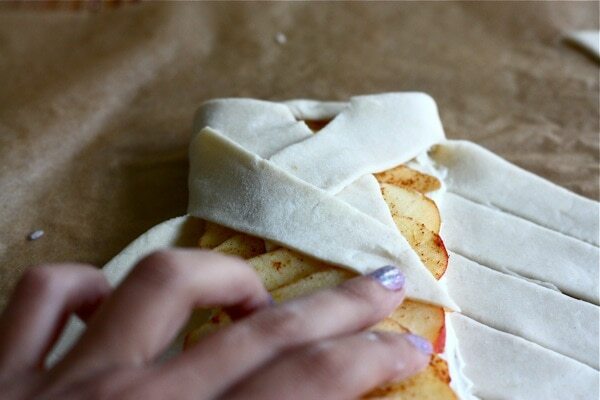 Transfer the sheet of puff pastry to a piece of parchment. At an angle, slice off the top corners and cut two notches in the bottom. 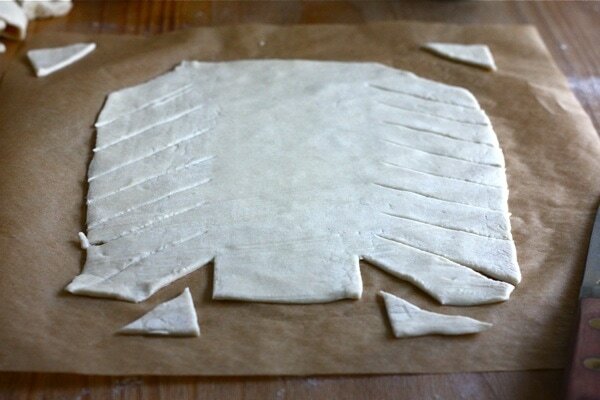 Slice 1-inch strips diagonally down both sides of the puff pastry, leaving the center uncut. Try to cut the same amount of strips on both sides. I had about 8 strips per side. 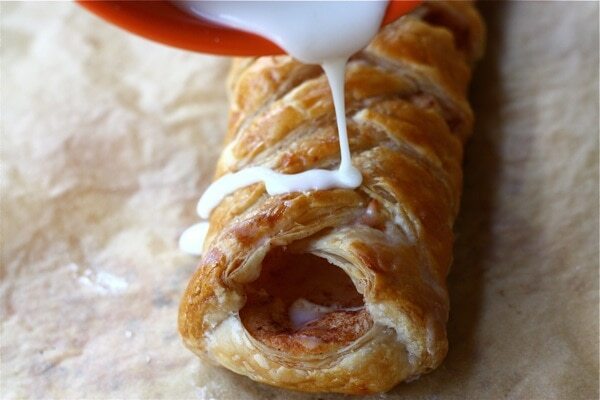 Add three tablespoons of cream cheese filling, spreading it evenly down the center of the puff pastry. 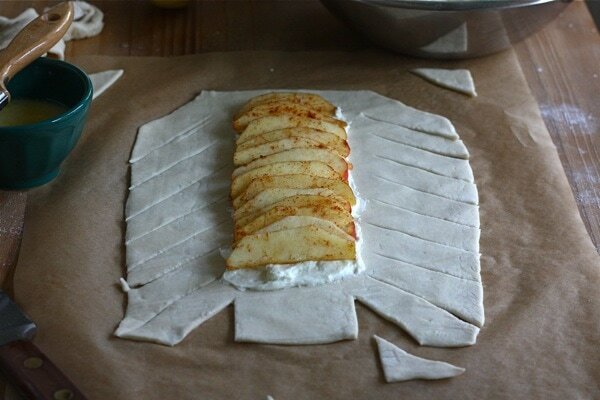 Top with apple slices. Transfer the danish (with parchment) to a baking sheet, and brush top with egg wash. Refrigerate for 15 minutes. Transfer baking sheet to oven and bake for about 20 minutes, or until puffed up and golden brown. 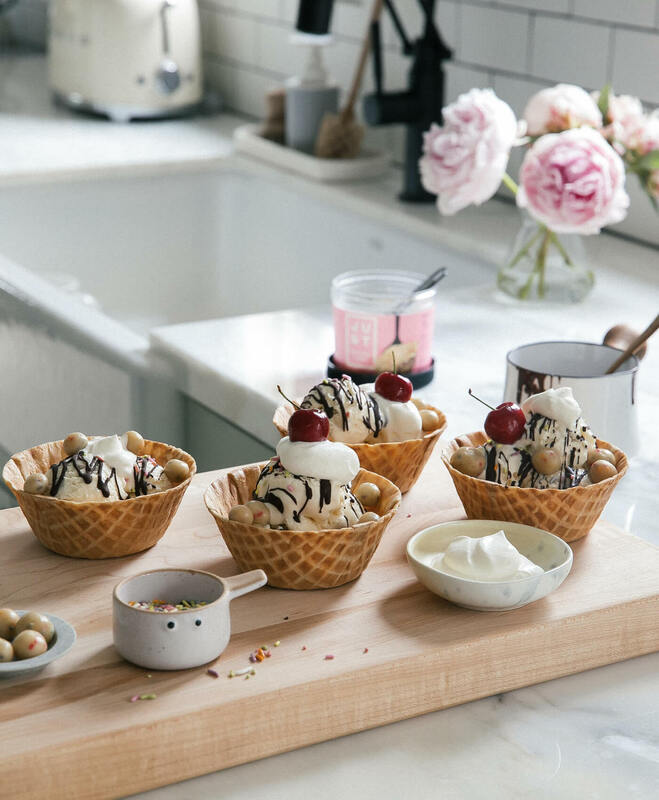 wow, this looks so very delicious! love your postings!!! Oh man $10 for butter and flour?! That stuff had better be good! 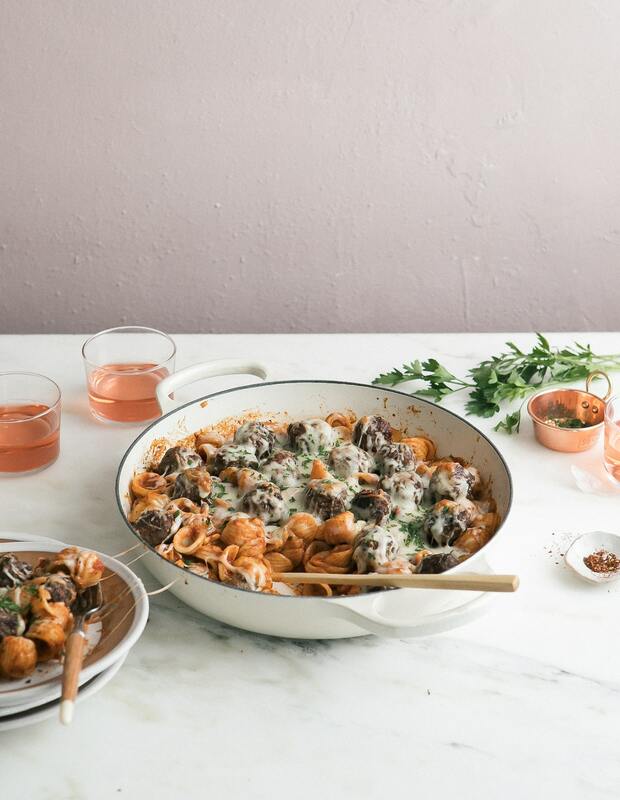 This recipe looks amazing though, definitely bookmarking. I just spent 5 hours making my own (which needs to then sit overnight), and when you factor in time and the cost of a lb of butter (the recipe called for 4 1/2 sticks), then I would definitely say $10 doesn’t sound so bad to me right now! And to note, my packed lunch included a roll with Italian meats, cheeses and picked eggplant, with a Pellegrino Aranciata. Yep, I had the typical Italian lunch, and kids thought I was strange..
HA! I want your childhood lunch right now. This is heavenly looking! Darn, I need these in my life! Gah! 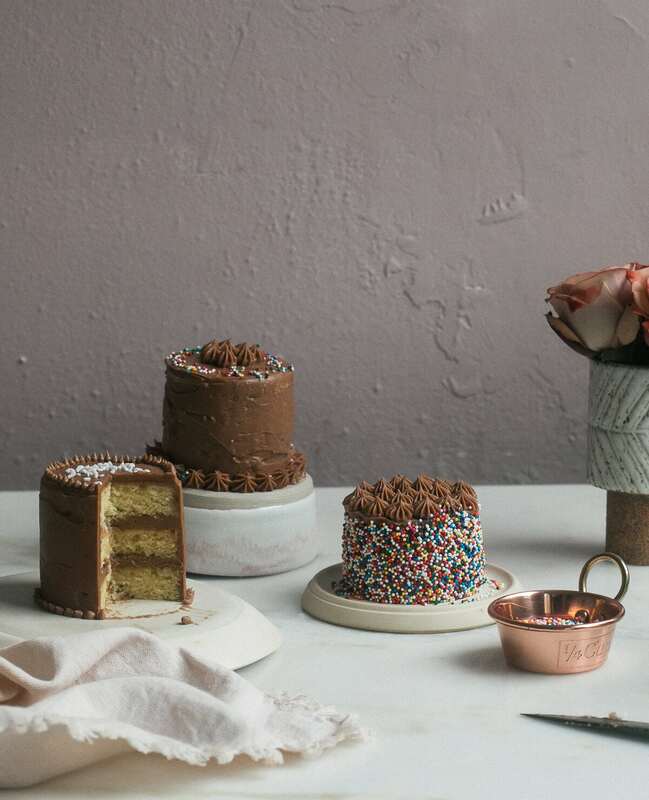 This looks way too good; I’d love to give this a try as I’ve always wanted to bake pastries. P.S. I was super normal at school, too! heh! i remember you talking about your lunches in school. speaking of lunches, i’d like this for lunch. This is so cool. It makes up for all your previous uncoolness! I’m so glad you showed detailed photos of how to do it, because I’m pretty sure I would have botched it. I love all the dribbling glaze, this is a beautiful post. This is calling my name for breakfast this morning. and your pictures show the process and the oooey gooey deliciousness so perfectly. Always love reading your blog! 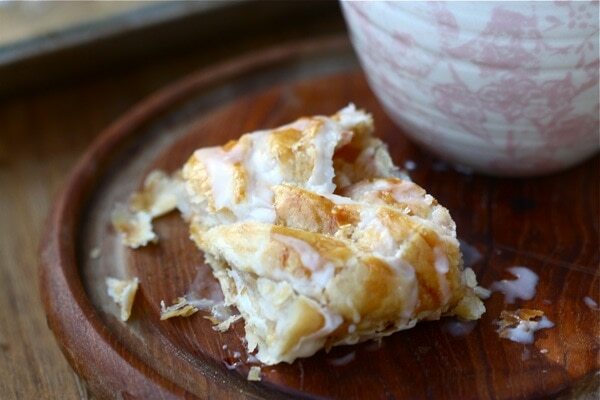 this is seriously gorgeous…not to mention i LOVE apple cheese danish and will now be craving this all week long! So pretty! And, obviously, delicious looking. Thaaaat’s how you make that cool ripply look on top! This looks delicious. P.S. I was totally the kid with the crazy lunch full of real food. My parents sent me to school with cloth napkins and real silverware. I was both absurdly normal and hyper responsible. Awesome sauce. HAHA! Real silverware?! That sounds incredible. I dig your parents. So beautiful! This would be fab around the holidays! I cracked when you said your dad used to buy you boys tennis shoes. Kinda sad! Aww! It’s ok though, you’ve got a danish. And most boys don’t! 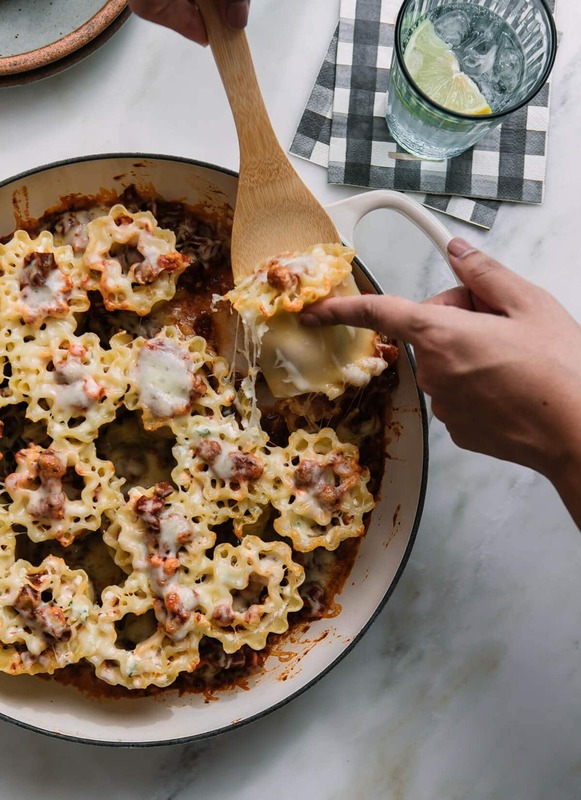 Wow, if I make these for the holidays, what’s everybody else going to eat? No, but for serious. These will not make it out of my kitchen unscathed. I’m a bad sharer. That looks so delicious! Not to mention pretty! And where did you get that cute little wooden plate? I love it! One of my good friends bought it at a yard sale for me. It’s actually a wooden mini-cake stand. It even came with a glass top. I love it! It looks so good! And so pretty. Well done, you braid star. I would def need to watch that video like eight times first…but it looks worth it, totally. Now I’ve gotta move on and try to braid up some danishes! That braiding technique is great! OMG! I think i’m in love with the danish! Love your recipes! Thanks for sharing! 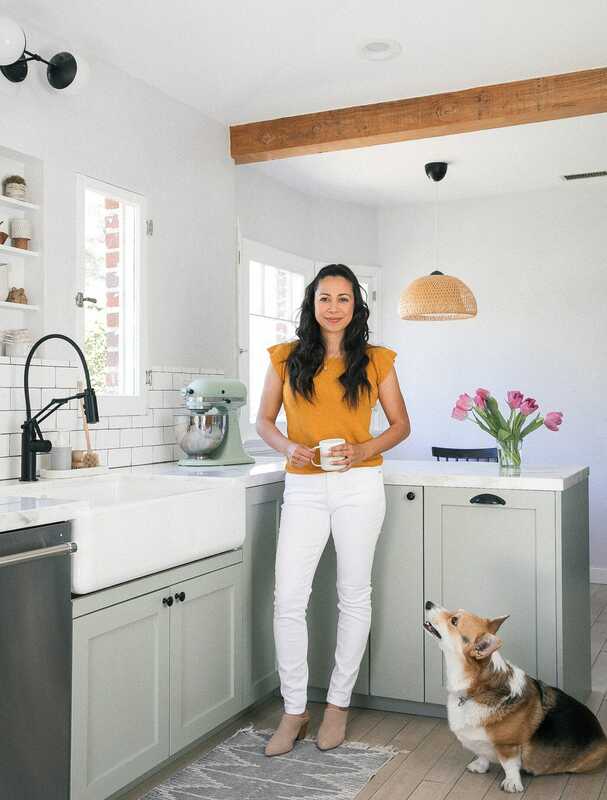 I LOVE your humor – and of course the recipes…not to forget the PICTURES! Awesome blog! That is awsome, and looks sooooo easy to make!! 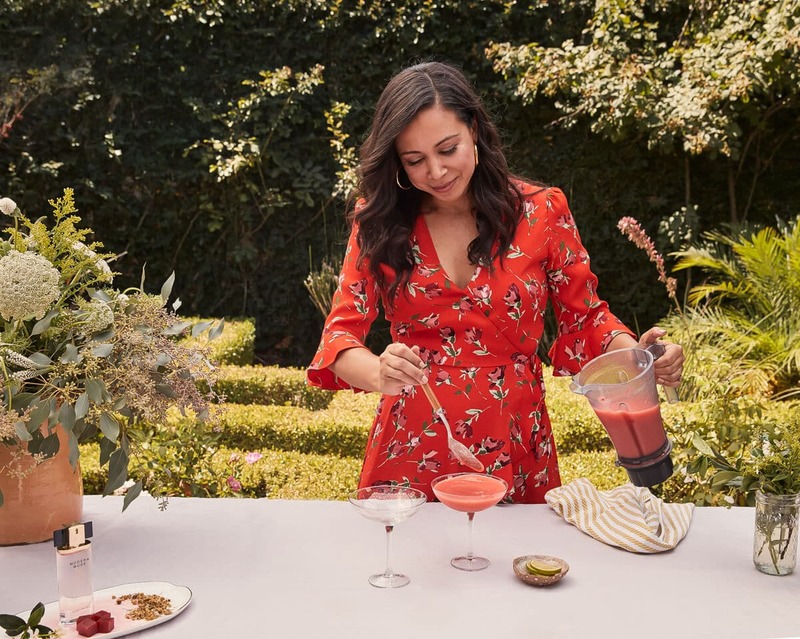 (getting my recipes ready for the holidays…this is a keeper)!! So gorgeous! What a pretty dish. Wow 10 bucks for a 2 pack? I often find the same thing at my local scratch and dent/salvage grocery for $2! 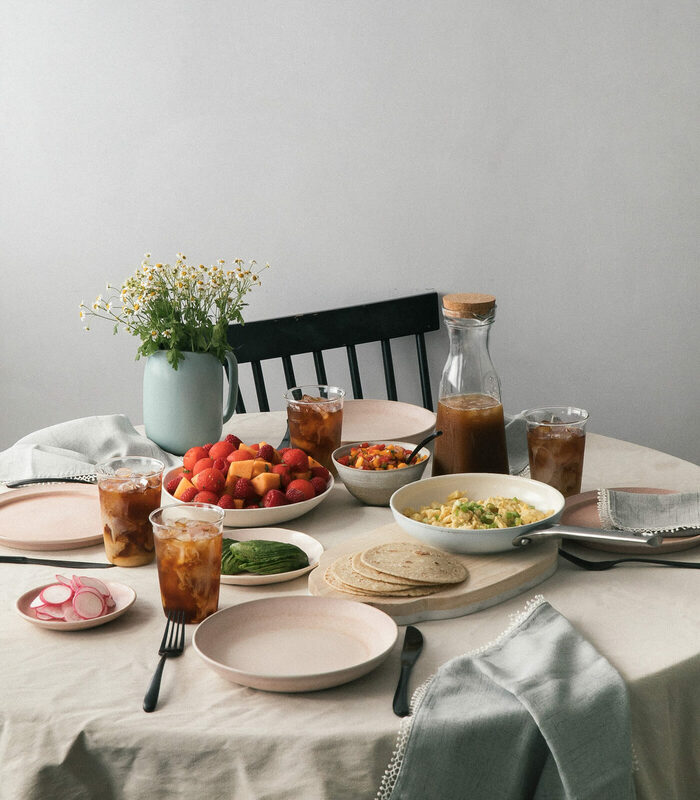 Anyway I’m definitely bookmarking this so I can come back and make this! It looks amazing! You make it look so easy- thanks. I’m going to try it and perhaps share it with my husband. Mm.. Just bought a ton (not literally) of apples and I see my next apple project! Danishes are my favorite so thank you thank you! 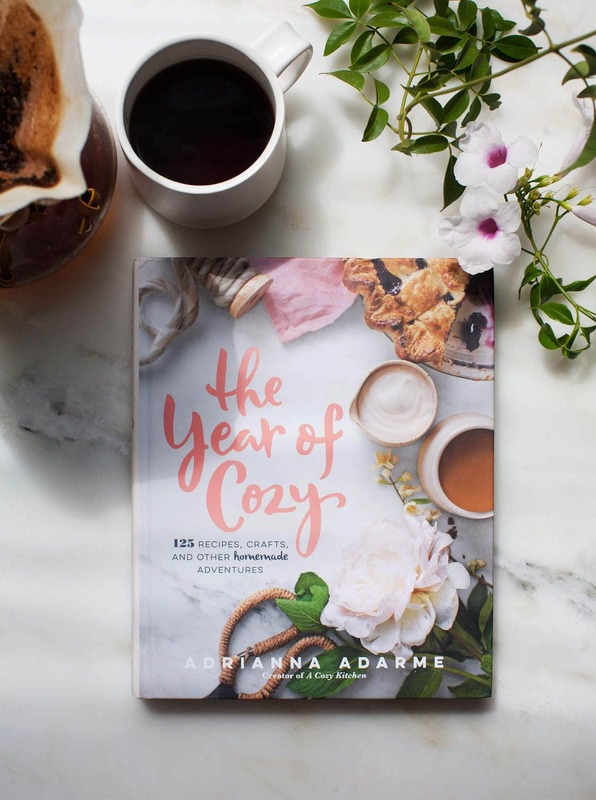 Adrianna – you totally inspire me.. Thank you! To answer your question, I haven’t taken classes for either. I buy dishes and props that I think are cute (and on sale) and generally try and take photos when I have really good light! Hope that helps! This looks so delicious. Way better than the boxed Entenmann’s stuff! We normal ones always turn out the best. I’ve been reading your blog for sometime now, but this post? Those apple cheese danish photos? Almost made me lick my screen. I was the weird quiet girl who did weird things to her bangs because I had frizzy hair and was unable to even put it in a ponytail. I’m still the weird (no longer quiet) girl who still can’t do a good ponytail, nevermind a braid. But that’s ok because I can bake and I want to bake that danish!! It looks sooo good! 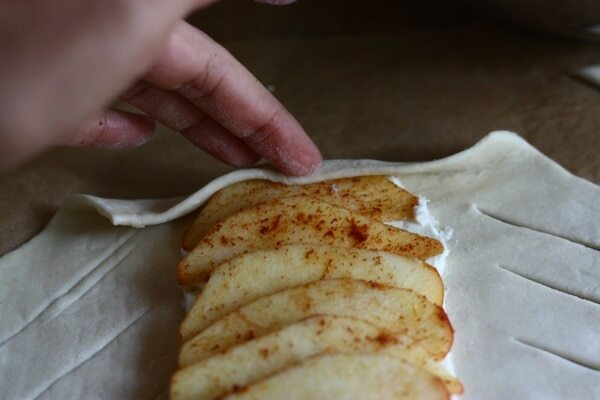 Do you do all of this on parchment paper and then just plop onto a baking sheet? if so…brilliant! I just moved to a new place and we have a horrible 70’s kitchen with those disgusting grout-y tiles (major downgrade from granite counters). So I have been needing to find a solution to rolling things out without going and buying one of those rolling mats…because a trip to the cooking supply store is too dangerous! great description – “fall in a bowl” love it!! 🙂 these look yummy!! Our dads must be brothers–mine got me men’s sunglasses and deodorant because they were “better” too. No prom queen here. I wish this recipe magically yielded 10 of these lovely things! Two would definitely not be enough. Two would be like, enough to make sure they turned out okay. Maybe I can find a mega-pack of pastry dough and make a mega pile of them! I had un-cool school lunches, too. Bread that was not only whole wheat, but RECTANGULAR instead of square. And filled with crunchy natural peanut butter and honey. It’s crazy how things come full circle. As much as I ‘hated’ my parents for packing me healthful, uncool school lunches, that’s what my kids will get! I wonder if I’ll have it in me to get them to ‘cool’ status somehow. I think my husband would fall over in utter bliss if I made this for him! This looks like I’ll prepare it for my birthday in november! Nice recipe! Oh and congrats on learning how to braid; it really is a messy hair saver! First of all, love your stuff, although getting your posts sent to my inbox every day is starting to get dangerous for my waistline. I tried this and love it. I’m in the UK, so I think my measurements were way off and I had loads of extra cheese mixture, plus my pastry sheet was huge, so I just made one giant danish, resulting in a slightly undercooked bottom layer. Nevertheless, it was delish and my mother has already requested I make it when I come home to the USA for Thanksgiving next month. Ooh, and I had some walnuts lying around so threw those in. Yum crunch factor. PS School lunch box hell is also terrible for us Jewish kids who had to bring nothing but matzah to school for a week a year! This makes me so happy. Love it. Wanted to know if you think i could freeze this ? Before or after cooking it ? Oh you can definitely freeze it before baking it. Should work like a charm! Just be sure to wrap it correctly. If not serving immediately, I’d wrap it in plastic wrap. I bookmarked this about a week ago and came back to it today. Wow! What a recipe! So good! I did one pastry with granny smith and the other with gala. They came out great! Was so happy to share the results. Thank you!! I made this today and it was so delicious! I made one danish with gala apples and the other with cherries. UGH! 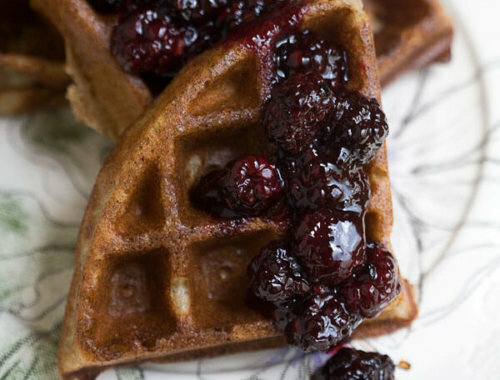 These are insanely delicious! I cannot stop eating them but I have to. Any recommendations on make ahead? 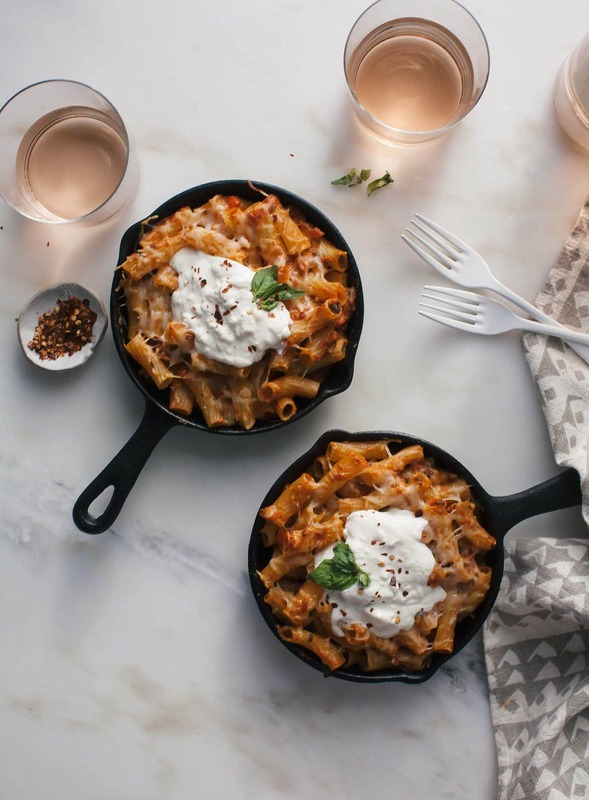 Could I assemble the night before and bake in the morning before a brunch? I hope, I hope, I hope……..
Is this as easy as it looks? Your pictures are really beautiful! YES! It’s pretty simple stuff! I made this yesterday for breakfast, and it was awesome! I halved the recipe since it was just me and my sister, and we ate the WHOLE Danish. One thing of note: you said to spread 3 tablespoons of cream cheese mixture down the middle, but I definitely had way more filling than that. I went for it and added all the filling, and there were no leaks! Just wanted to throw that out there in case anyone is worried about using all the filling 🙂 We ate this with bacon, and it was the perfect sweet/salty balance. Thanks for the delicious recipe! I’m drooling! Can’t wait to try. Thanks!